The clocks had sprung forward this Mothering Sunday and the sun came up in a cloudless sky. The Buachaille took on the warm tones of the sunrise as I wiped the ice from the inside of the car windows. The previous day had finished with some slushy surface conditions and It was clear that this would have set up hard during the cloudless night so I was in no real rush to get up first tracks. But hey, it looked sunny, there was snow on the hill and no wind to speak of. The walk across the Plateau to the snow was interrupted when I got side tracked by a couple of stags grazing on the hill. 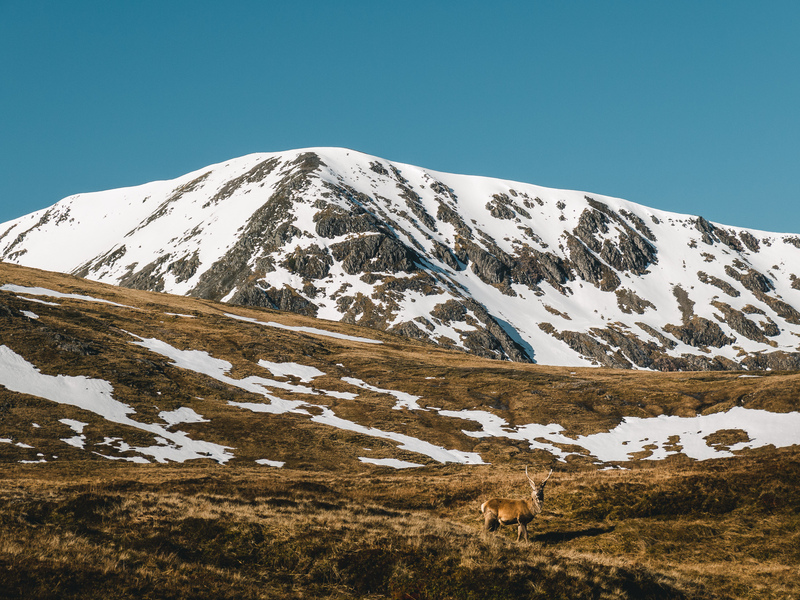 Very apt since the Gaelic name for the hill is Meall a’Bhúiridh (the rounded hill of the (stags) bellowing, or the hill of the roaring stags. I only had my point and shoot camera with me but I couldn’t help stalking the deer, trying to get the snowy slopes of Creise as a backdrop. Since there was no snow low down, the walk takes you to the Cliffhanger Chairlift to take you put to the summit lift. I could see the groomers finishing off their work under the top lift. There hadn’t been too many down Main Basin by the time I got to the summit, but it looked great with corduroy slopes leading down to the Haggis Trap. The air temperature was noticeably colder. Despite the strong sunshine, the air was coming from a colder place today and when I dropped into the Main Basin, even the recently groomed snow was crispy and firm. Once again despite the amazing weather and existing snow, there were no crowds to speak of, so I made the most of this doing laps of the top and using up what groomed patches of snow I could. It was the annual snow festival and by all accounts the lower slopes were busy with sledging kids and families. The guys at Coe had also connected Mugs Alley with Coire Pollach and the Cafe. I had brought a bag with food and drink, so I could stay up top, hoping that the snow would soften up a bit. There were never any queues for the summit, but the numbers slowly began to rise. Still not as many as you would think in bluebird conditions. At some points it did feel busy within Main Basin itself, but you didn’t have to wait long before it emptied again. The snow started to chop up, but showed no sign of softening. For this reason I didn’t bother with Spring Run. Patrol mentioned that the bottom sections was a bit rough. Some of the bumps made for good little jumps within the Basin and some of the guys had done the hard work building a nice little jump above the Haggis Trap. It wasn’t long before most folk were giving it a go, including myself. I must say, I didn’t land it all day, sliding out on my heel edge. I did film it, but was more concerned with keeping my camera straight, rather than concentrating on what I should be doing. It was good fun, but my body was definitely feeling it the next day. Whether it was down to the clocks going forward or not, the few people that were at the top of the mountain started disappearing soon after lunch and it got really quiet. Hopefully this colder spell means Main Basin will stick around and they can open next weekend squeezing a bit more value out of my season pass, now that it has at last paid for itself despite this being one of the worst snow-fall seasons. I was reminding myself that all the snow on the hill that we had ridden of late was all from about a week of snowfall. And, I know I keep saying this, but it dies look like there is more snow on the way. My final run down off the mountain was the Wall. The ski cut tracks had frozen solid giving the snow a corrugated feel. When the snow ran out, I took the easy walk back to the access chair enjoying the sunshine. Maybe if we do get snow, I can work on those jumps next weekend. Shout out to Stevie McKenna for his photos from the day. That jump didn’t go well!